Home » Events » "Speaking for the silenced"
We are privileged to host the American-Portuguese author of ‘The Last Kabbalist of Lisbon’, which was the No. 1 bestseller in 12 countries, including the United States, the United Kingdom, Portugal, Italy, Brazil and Australia. 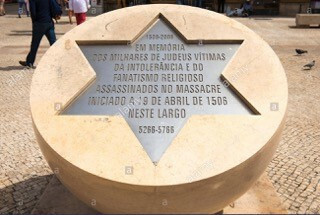 This work recounts the appalling massacre of the Jewish population in Lisbon in 1506, after a misunderstanding during a mass in the Igreja de São Domingos, Rossio, during a famine. It has been published in 23 languages. This year he will be publishing another book entitled "The Gospel according to Lazarus". Light refreshments will be served during the first half an hour. After the event, members and their guests are at liberty to go for dinner at a local restaurant (A Adega do Monte) at their own cost. (Between Av. São Pedro and Av. Itália. From the ‘Marginal’, after the ‘Jardim dos Passarinhos’ in Monte Estoril head up the Av. São Pedro. Turn left at the second crossroads and then first left. From Cascais or Sintra should head for Av. Itália and turn off towards Monte Estoril opposite Zurich Insurance, and then first right). Price: €5.00 (payable on the day).